The City of St. Petersburg was established in 1703 by the Russian emperor Peter the Great, who wanted to move the capital city from the landlocked Moscow to a new city with a harbor for commerce and military navy. Peter named his new creation after Saint Peter. Today the city has more than 5 million inhabitants. Peter wanted to build a modern European capital and for that purpose he invited famous Italian architects. Many of the original historical, architecturally interesting and unique sites and buildings Peter's architects designed are still standing today, and our tour will give you a thorough introduction to all the major sights of today's St. Petersburg. We depart from the port and will drive through the Vasili Island residential area directly to the Peter and Paul Fortress, which is the spot where Peter laid the first stone for the city's foundation. The fortress quickly lost its military value, but later it gained infamy when it was used as a political prison. 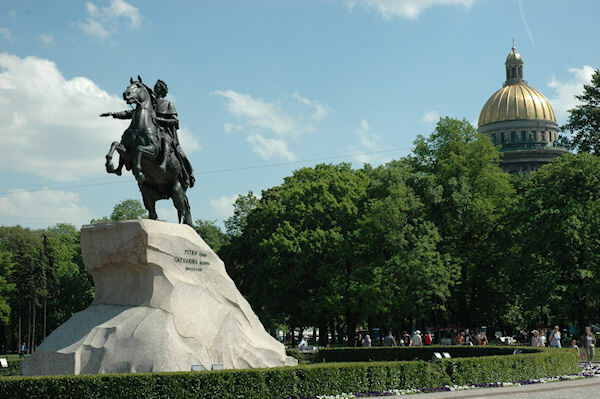 Our tour will include a special visit inside the walls of the fortress and we will also visit the famous cathedral, where the tombs of all the Romanov dynasty rulers and their family members have been buried, starting from Peter the Great himself and terminating with Nicholas II, the last emperor of Russia. We shall make our way from the port to downtown, passing the Nikolai's Church and the world famous Kirov/Mariinskij Theatre, pass some canals, cross several bridges and drive through open squares before arriving in the Strelka peninsula on the Vasiliev Island, which provides a panoramic view, and an ideal photo stop of the Neva River and the city profile standing on the opposite bank of the river. We'll be admiring the Winter Palace, the Hermitage, the golden cupola of the St. Isaac's Church, the Chuch of the Spilled Blood, the Peter and Paul Fortress, the revolutionary Cruiser Aurora and many, many other points of interest. Peter and Paul Fortress – The location where the first brick was laid in 1703, and from where the entire city started. To protect his new Russian capital Peter the Great decided to build first a fortress to protect the city against the Swedish attacks. However, the fortress soon became Russia's Tower of London, a place for imprisoning politically harmful people - including, among the others, Peter the Great's own son. Inside the territory we shall visit the Peter and Paul Cathedral - the city's tallest structure in the days of Peter the Great. The traditional, ornate church interior boasts gilded iconostasis, 18th century paintings and icons - and the tombs of many Romanov Dynasty Tsars and Tsarinas, including Peter the Great, Catherine the Great, and her family members, and the last Tsar, Nikolai II. – An inside visit to Peter and Paul Fortress and St. Peter and St. Paul Cathedral. We will also drive along the crowded Nevskij Prospekt, the world famous main street, which is today the commercial center of the city. On Nevskij Prospekt we'll see the beautiful Anichkov Bridge with its horse statues, several palaces, the Alexandriinskij Theatre, the Gostynnyij Dvor department store, the Kazan Cathedral, and all major shops and restaurants are also located on this street. A scheduled shopping stop will be included. This tour requires minimal amount of walking and depends on the individual desire. Photo Stops: Isaac's Square, Spit of Vasilevsky Island, Peter and Paul Fortress, the Church on Spilled Blood, Cruiser Aurora. Photo stops at Spit of Basil Island, Church on Spilt Blood, Aurora, St. Isaac Square, etc. You do not need a separate Russian visa to take this tour from your ship. Our tour operator is authorized by the Russian Ministry of Foreign Affairs to arrange services for cruise passengers who do not have Russian visas. In order to guarantee visa-free participation in this tour, we need to receive a Tour Authorization Certificate for you and each person in your traveling party. We must request this Tour Authorization Certificate from our operator no later than two (2) weeks prior to your sail date. After we receive your excursion order, you will receive an email from Shore Excursions by PortPromotions.com asking for your passport and other information. You must provide us with your passport and other information at least two (2) weeks prior to your sail date or we may not have time to receive your Tour Authorization Certificate. Please respond promptly to this request. We will email you your excursion tour voucher for your traveling party, and one tour authorization certificate for each member of your traveling party. It will be your responsibility to print and carry with you 1) the tour voucher, 2) the Tour Authorization Certificate, one for each person traveling with you, and 3) a valid passport for each person in your party. These documents will be required to participate in your St. Petersburg excursion. Failure to have these documents to present to Russian immigration officials and your excursion leader may result in you not being allowed off the ship in St. Petersburg, and may not entitle you to a refund. Please refer to the full terms and conditions listed on our website.